University tested, optimal levels of electrolyte, easy to use quick absorption powder. Due to shipping cost 20# size only available for customer pickup. Years of substantial scientific study with results for improved electrolyte response to help assure the validity of product claim. Uniquely designed powder, rather than a paste. The powder allows for a more rapid absorption rate, as pastes tend to absorb slower due to fluid imbalances and dehydration. 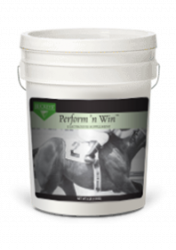 Can be used in horse's drinking water daily. Diluted solution adequately replenishes small amounts of electrolytes lost in normal workouts. Will mask strange tastes in water when traveling to new locations. No more transporting jugs and gallons of water to events or shows. INGREDIENTS: Salt, Potassium Chloride, Magnesium Sulfate, Dextrose, Sucrose, Calcium Citrate, Fumaric Acid, Citric Acid Anhydrous, Silicon Dioxide, Natural and Artificial Flavor. CAUTION: * Do not feed to sick horses unless advised by your veterinarian * If the Perform 'n Win™ powder is fed, water must be consumed at a minimum rate of 1 quart per ounce of Perform 'n Win™consumed.